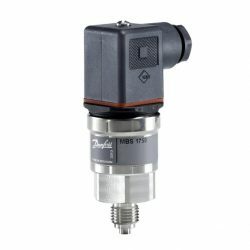 Designed to control and monitor industrial application systems, the KPI is a compact and robust solution that offers safety and longevity. The KPI is available in pressure ranges from -0.2 to 28bar, meaning you can easily find a KPI with the pressure setting that you require. Easy and stable setting values make it easy to control liquid and gaseous media in most industrial applications, e.g. pumps and compressors. The small dimensions of the KPI save space and makes it easy to install. Please contact us to enquire about spare parts and accessories for the KPI range. The KPI is highly resistant to shock and impact. It is vibration-proof from 0 to 1000 Hz, 4g (1g = 9.81m/s2), the KPI is ideal for mobile applications where shock and strokes occur. The KPI is designed to have ultra-short bounce times – the perfect single pole double throw (SPDT) snap-function minimises wear during each operation and extends contact life. The SPDT’s silver contacts can cope with loads up to 16A, 400V AC3. Gold contacts are also available to ensure perfect function with low electrical loads. On average, the KPI can perform more than 400,000 electrical operations during its lifetime, which is four times more than approval requirements. 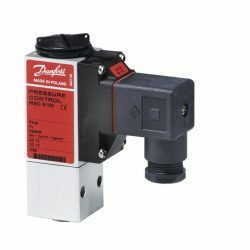 Danfoss KPI pressure switches are used for control, monitoring and alarm systems in industrial applications. 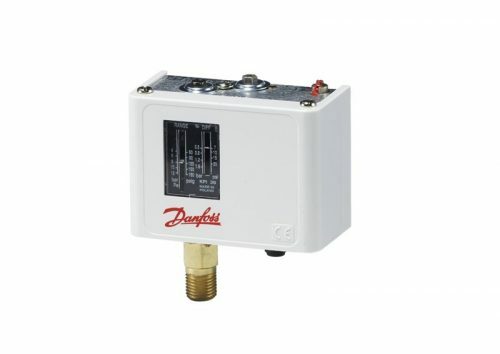 The KPI series are suitable for plant in connection with liquid and gaseous media. They are fitted with a single-pole switch changeover (SPDT). Available with gold plated contact systems. Scale for setting range and differential. Enclosure IP44 when mounted with top cover and back plate. Snap action contact system with omega spring. Ambient temperature: -40 to 65ºC.